Rotterdam est une ville très vivante culturellement. de bons restaurants, les bars, musées. Prendre le barbus pour traverser la rive, se rendre à Dodretch. The Netherlands anti-Amsterdam, this modern city lacks the historical buildings of Amsterdam, but shows off the future of the Netherlands. This is a very nice major port city in the Dutch province of South Holland. Most of the buildings were destroyed in WWII and is more modern so there are not as many tourists here, less bicycles too. We like this city because it is easy to get around here and around the country. Great food at Azura, asian cuisine. Great atmosphere and food that you will remember. The Rotterdam blitz was the aerial bombardments of Rotterdam by the Luftwaffe the German air force on 14 May 1940. The objective was to support the German troops and break the Dutch resistance. The bombardment destroyed almost the entire historic city centre, killing nearly 900 people and making 85000 others homeless. Perhaps a strange beginning of a description about the city of Rotterdam. But it is necessary to understand why it’s the most modern city in Netherlands in terms of architecture. Simply because they had to build up the city again due to the bombardment of 1940. 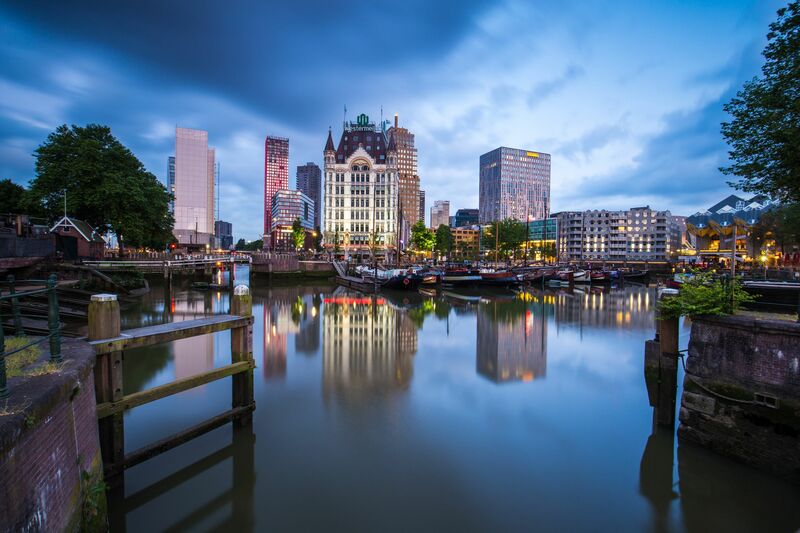 The city of Rotterdam is also known for the Erasmus University, riverside setting, lively cultural live and its maritime heritage. A varied architectural landscape including sky-scrapers, which are an uncommon sight in other Dutch cities. The port of Rotterdam is the largest cargo port in Europe and the 10th largest in the world. Fortunately, a number of areas escapes the bombardment. Delfshaven (Deft Harbour) is such a neighbourhood that you definitely must visit in Rotterdam. Great town, went back this year and had the chance to walk around this city.Their new Food Hall (Markt Hall) it`s one of the best architecture buildings i`ve seen in my life. Take a day from Amsterdam and visit this town. Rotterdam is a city in South Holland, the Netherlands, located geographically within the Rhine–Meuse–Scheldt river delta at the North Sea. Its history goes back to 1270 when a dam was constructed in the Rotte river and people settled around it for safety. In 1340 Rotterdam was granted city rights by the Count of Holland and slowly grew into a major logistic and economic centre.